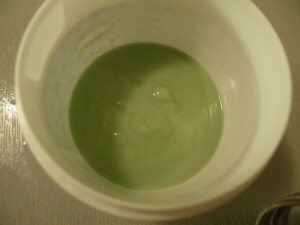 In this post I show avocado hair conditioner recipe for dry hair. In my previous post, I introduced the theory and the results of my experiment comparing Olivem 1000 and BTMS as two main emulsifiers for hair conditioners. It was this recipe I used in the experiment. My thin and bleached hair did not really appreciate the Olivem 1000 version – see Making hair conditioner – what did I learn and a small experiment. I did like the version with BTMS, although next time, I might use half of the quantity of the oils. Inspired by aroma-zone.fr Guacamole brillance pour cheveux secs and ternes. 6) Add phase C – again, here some people prefer doing one by one, I usually prepare it in advance and mix it together. Then I stir it in slowly. For those that do not have a special conditioner emulsifier to make your hair conditioner, do not worry! You can still make your hair a very nice hair mask before washing! Although I do not think it will help detangling your hair, but it can certainly help nourish your hair. This entry was posted by evik on November 7, 2012 at 11:58, and is filed under hair. Follow any responses to this post through RSS 2.0.You can leave a response or trackback from your own site. Do you still use this recipe when you make conditioner, Evik, or do you you use something different now? I’ve never made my own conditioner (or shampoo) before; does this recipe give as good a result as store-bought conditioner would you say? Oh I see, what you are saying is that it can still be made with olivem 1000, it is just little greasy and needs washing afterwards, right? That means I can also make it with E-wax, right? I guess if I was to wash it off anyways, then it really doesn’t matter. By the way, I see how you also added some citric acid for Ph balancing. May I know what is the proper procedure in this? Do I make the conditioner, test its Ph then add citric acid towards the end? Do you add the same amount anyway without testing it first? Noticed how you mentioned we can use other types of oil, does it affect the Ph of the conditioner? How do you know how much citric acid to use in the formula? Hi Catarina – no, Olivem 1000 is not really working. It is basically as applying any cream to your hair – it won’t work as conditioner and won’t wash off your hair. This is what I didn’t know back then when I made the test. Conditioners are made using special cationic quartenary compounds that act also as emulsifiers (like BTMS) that have exactly the effect we need from a conditioner – they make hair smooth, without static electricity, easy to comb… this is not the case of classic emulsifiers used for creams. As for the pH – yes, you first make your conditioner, then test, then add some citric acid, then test again and correct… until the correct pH. Oils would affect pH of the conditioner, but not very importantly, towards acidic scale. I do not know how much citric acid to use, unless I have a recipe that states it. It is question of the ingredents you use and their acidity/basicity. Normally, however, we talk about drops. is the green mineral oxide important? If it’s not added does it effect anything? And the EO do you have to use lime or can you use another, like lemon for the citric acid or lavender?